Like the name suggest, a narrow isle forklift is designed for you to fit down tight passageways. If you have a cramped warehouse, you should invest in a narrow isle forklift which will have no problem getting in those constricted places. Forklifts are good for a lot of things, but they can also increase liability in your warehouse. One simple mistake could end up injuring a lot of people or property. Narrow isle forklifts can help ensure the safety of everyone. 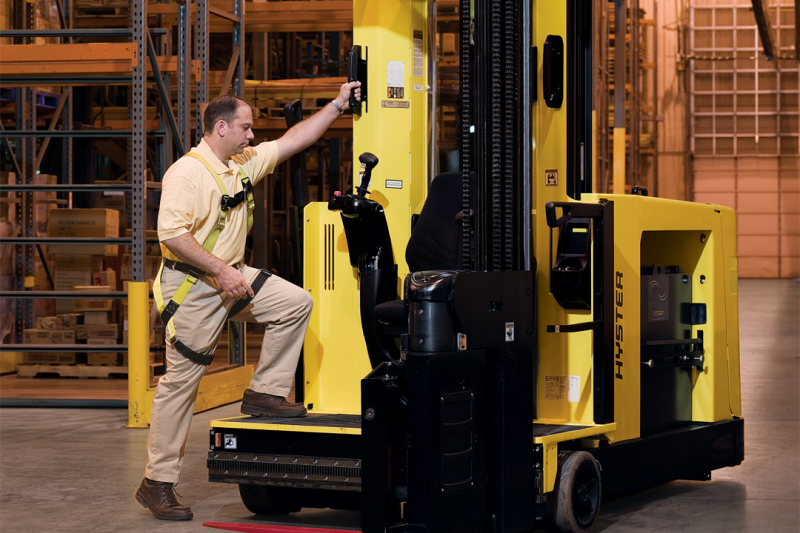 These forklifts are easier to control than conventional lifts, especially for beginners. Narrow isle forklifts are usually less expensive than a typical forklift. And, unless you are going to haul a heavyweight load, you won’t be losing much capacity limit with a narrow isle forklift. Narrow isle forklifts are driven standing up due to their reduced profiles. This is actually easier on the operator as the weight of their body is supported by the legs and not the lower back and spine. On a conventional lift, this pressure could result in back problems and daily fatigue. Although a narrow isle forklift’s main benefit is its maneuverability, there are also many other added benefits. Contact your nearest location and give us a call today for more help on how a narrow isle forklift can help you.